Sometimes we just don't see it coming. Life brings changes we never dreamed of. The changes can be full of hope and excitement with so many opportunities and possibilities in front us. Other times, these changes can be the opposite. The loss of a dream, a relationship, or even a life. Recently, HYD had the great privilege of walking alongside a loving mama named Leanne who had to say goodbye to her baby son. Leanne also happens to be a dear childhood friend of mine. November 14, 2012, Baby Drew entered this world as a mighty warrior fighting for life from day one, 8 months later, he "passed peacefully from parent's arms into the arms of Jesus." I won't begin to share with you the journey this was for my friend & her family, you can only imagine. God never left their side, but the pain endured and the loss they continue to feel matches nothing I've ever known. If you're interested in reading more, here is the CaringBridge journal. What I do want to share is what life is like two years later, when the room in their house that was to be Drew's still sits waiting for him to come home from the NICU at Vanderbilt that he never left. Drew's mama has tried for months to redo the room, find new purpose for it, and let go of some of Drew's baby gear that he'll never get to use. There are so many emotions attached to these items. When we lose something precious, our grief process may have some similarities to others but truly it is always our own process. Drew's mom has clung desperately to her faith, her family, and her friends. Leanne's transparency through this journey has been immeasurable. It has also allowed countless others to confess the hard, ask for help, and find healing through inviting others to share their own burdens. In this season, after all the CaringBridge readers are gone, the sympathy cards and casseroles don't come any longer, and most people think her family ought to be "back to normal," Drew's mom knows that the healing will never be full until she holds her boy again in Eternity. Until then, there's a room in her home that needs new life. This is where Help You Dwell comes in. Leanne knew it was time. She was ready. She called and said she didn't know where to start. Caroline and I got there at 10:30am and by 2pm, Drew's room was well on it's way to be a guest and family craft room for both she and her 9 year old son, Nate. The process was wonderful and hard at the same time. Drew's mom got to sift through some of the thoughtful, handmade gifts she's received along the way. HYD helped her make decisions about how to donate certain items and how to discard others. One of the hardest items to let go of were the sippy cups she had saved for him. Any of you who've had the blessing of multiple children have saved items from your older kids that the younger ones can use. This bag of sippy cups had been Nate's. All the other items she had saved could be donated or given to a friend to use, but sippy cups aren't really items to share with others. You really just use them for your own kids so she knew they would just have to go in the trash. It's amazing how so much of a person can be wrapped up in an object. Listening, waiting, and gently encouraging her to let go of the bag of cups wasn't easy but it was good. She would agree. We moved on to the next items and by 2pm, the room was transformed into a place that allowed her to see all kinds of possibilities. 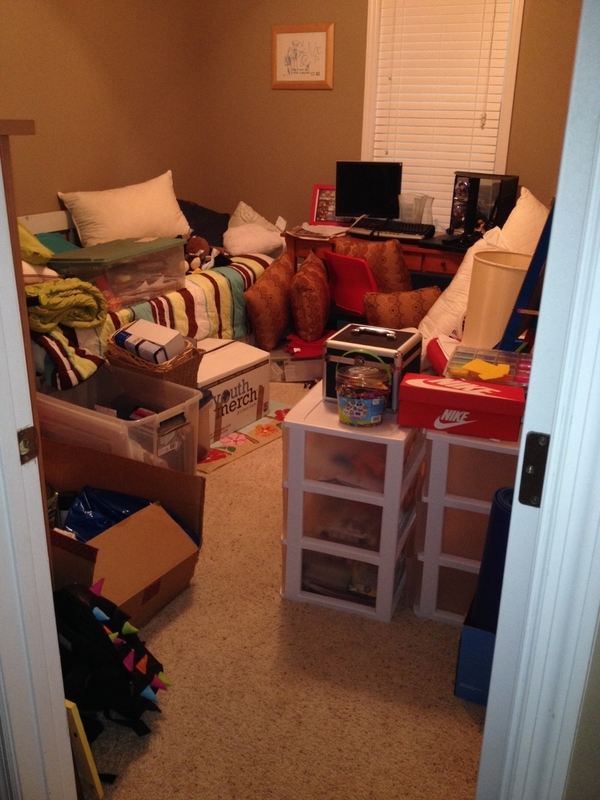 Yesterday, Taryn and Caroline came and helped me declutter Drew's room. It was an amazing, productive, and heart wrenching time. It felt like forever, but it was 4 hours. Funny how you lose a sense of time when you're in that kind of space. (at one point, I commented that cleaning out spaces seems to go a lot faster on HGTV) I was so anxious leading up to our time and asked so many to pray for that time. God was faithful to be there. He gave me a willing spirit to get rid of stuff and to stay on task. He also blessed me with 2 precious sisters to walk with me in this process. What a gift!! Several times since they left, I have gone into Drew's room and just enjoyed the space. It's open and mostly organized. (there are still boxes to go through, but they are in the basement and out of sight... this could be dangerous. You know, out of sight. Out of mind.) I love the space and the reward of having purged so much stuff yesterday. However, I know the room isn't finished. We began the day yesterday discussing what the space should be. I LOVE, LOVE that Help You Dwell's goal is to make spaces functional and to bring purpose to a room. Caroline and I know that when we enter someone's home or even workspace, we often come across the parts of our clients' spaces that stay hidden. We expect to hear stories although they're never required. And always, there is no judgement on our part. We expect a mess, that's why you called us in the first place.